Back in 2006, Panasonic introduced the digital travel zoom compact camera with its Lumix DMC-TZ1. Ever since, travel zooms have acquired increasingly longer zooms and ever smaller bodies. Keen to establish a foothold in the travel zoom market, Nikon has launched the Coolpix S9300, which replaces the year-old Nikon Coolpix S9100 and competes with the new Panasonic TZ30 (and its predecessor the TZ20) and the Canon PowerShot SX260 HS. The Nikon S9300 sports a 16 megapixel CMOS sensor (compared to its predecessor's 12MP unit) and introduces GPS logging and 3D photo capability. It has an 18x optical zoom that extends from a usefully wide 25mm to an impressive 450mm and features relatively wide maximum apertures of f/3.5 at 25mm and f/5.9 at 450mm. 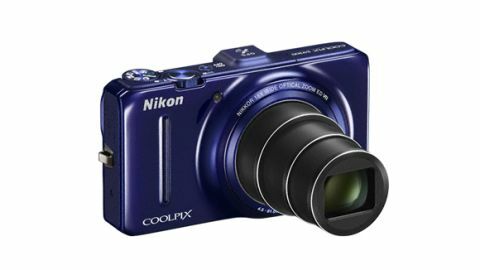 The Nikon Coolpix S9300 offers Full HD 1080p video recording with stereo sound and full use of the zoom, a 3-inch 921,000 dot LCD screen and fast autofocus. It can also take 360-degree panoramas and create HDR images, and includes optical vibration reduction. Sitting at the top of Nikon's Style range, the Nikon Coolpix S9300 has a recommended UK price of £300 and US price of $350. Nikon makes the bold claim that the Coolpix S9300 is "perfect for use in any situation" citing travel, sports events and concerts as its natural habitat. This new model features a compact body considering its 18x optical zoom, and thrives on point and shoot simplicity with 19 scene modes, a Scene Auto Selector mode and no manual or semi-manual modes. The absence of manual controls is odd, considering that Panasonic and Canon's similarly priced models offer shutter and aperture priority plus manual control – all in addition to numerous scene modes. Therefore those wanting any manual control over images should bypass the Nikon Coolpix S9300 and consider Panasonic or Canon's offerings.